Our Supporter Spotlight highlights individuals or institutions that contribute their time or gifts to the Santas. 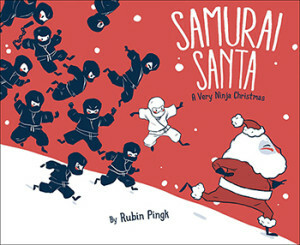 This week, the spotlight shines on Rubin Pingk, the author and illustrator of a whimsical new children’s book: Samurai Santa: A Very Ninja Christmas (Simon & Schuster 2015). 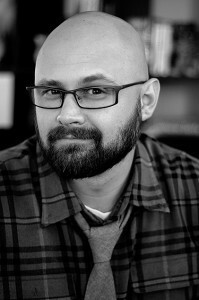 Rubin hails from Utah where he lives with his wife and two young boys who inspire his storytelling. Rubin is donating a signed copy of his book along with an original illustration to our annual Christmas fundraiser and silent auction. We are grateful for his support and curious about his work, so we asked him to tell us more about his book. Santas: You’ve combined two things that a lot of kids (and adults) love into one book: Christmas and Ninjas. Where did such a great idea come from? Rubin: Like Ray from Ghostbusters said, “It just popped in there.” I draw every day and haven’t missed a day in over 5 years. At one point, during the holiday season a few years ago, I drew some ninjas chasing Santa. When the government shutdown in 2013, I was out of a job for 3 weeks and decided to turn that old sketch into a book. Santas: You’re an illustrator turned first-time author, correct? Did you write the story and words first and then add visuals or does your drawing drive the writing process? Rubin: Right. This is my debut book. For this book, drawing drove the writing. I’m always thinking of a story as I draw. Sometimes, however, a piece of prose or narration will form first and I’ll create a drawing based on it. It goes both ways. Santas: Most people have a strong sense of what they think Santa should look like. Is that limiting, drawing such a well-known archetype, or is the challenge to make him your own in some way? Rubin: I based my Santa on the “moogle” character from the Final Fantasy games I played as a kid. I wanted him to be simple and iconic. There isn’t much to him. My Santa is broken down into his most identifiable parts. If I reduced his design any more he might become an abstract blob. Santas: Your donation is going to help buy Christmas trees for needy families, which is pretty cool. What role, if any, does a Christmas tree play in your own holiday celebration–past or present? Rubin: My mother in law is obsessed with Christmas trees. She has 3 or 4 of them in her home every year, each with different styles. We have a festival of trees in Salt Lake City, near where I live, and we love to go see the different themes designers and corporations come up with. A Christmas tree changes the spirit of a room. It is a harbinger of the best time of the year. Beneath its branches lies the promise of gifts and magic. They are often adorned with little memories and heirlooms. I can’t imagine having a Holiday season without a Christmas tree and I’m very happy to contribute to Christmas Tree Santas because I know you will bring joy to a lot of homes. Santas: What other causes are important to you? Let’s give those a shout out. Rubin: I was a scoutmaster for a lot of years. The next time some boyscouts come around selling popcorn or flags or whatever it is, maybe throw them a few dollars to help them pay for camps and gear. The BSA provides a scaffolding for teenagers to develop the type of character that creates good citizens, employees, parents and spouses. It is an organization that is perceived, perhaps, as being passé or outdated, but I hope it never goes away. I can’t think of anything that could replace it short of having Bear Grylls as a Dad. Santas: Thanks Rubin. Good luck with the book. Learn more about Rubin Pingk on his website and on Facebook and Twitter.